HOME IS ALMOST DONE! MOVE IN READY! PLAN #2593. Wide open floor plan with open entertainment and large great room! Built Green throughout! Upgraded insulation and additional sealing, casita can be used as a 4th bedroom, covered deck off of dining room, upgraded furnace, tank less water heater, and high quality home that is unique to the market. Den/Office on main floor could be used as a bedroom. Casita on main level has a 2nd kitchen (kitchenette) and is perfect for a 2nd living space. 2 master suites on main level! Landscaping: per Herriman City (front yard and side yards to back of foundation will be complete). Our standard features are most builder's upgrades (see attached list). 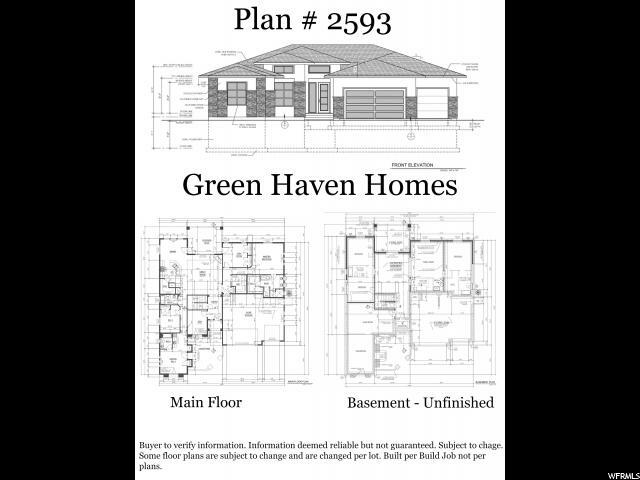 Green Haven Homes builds a quality home at an affordable price. Do you want to make some changes...no problem! Want to build a similar home and change it...no problem! Get the custom home you want. Buyer to verify all MLS data and information including, but not limited to: schools (changes in progress), square footage, acres, all HOA info, etc....Information is not guaranteed.